Are you ready to display your work in a gallery? A guest post by Jenny Timms. If you think the answer is ‘yes’, how do you do this? It can be a daunting undertaking if you haven’t done it before. Maybe you belong to an art group and you’ve been lucky enough to sell your work at group exhibitions. Hopefully you’ve sold and family members and friends are queuing up to tell you what a great artist you are! But here’s the crucial question – is your work really ready to be out there? And are you ready too, as an artist, a professional, a business person? We (Vitreus Art) opened our doors 18 months ago, after 10 years of selling through other galleries, online and at craft shows. Since then we have received a stream of people though the door asking if we would display their work and sell it for them. This really isn’t the way to get a gallery onside! Ask yourself – would I appreciate visitors to my workplace trying to sell me things? Probably not. A gallery owner has to be responsive to their customers (and potential customers). Artists turning up during the day without an appointment gets a future relationship off to a bad start! Do you have a website and a business Facebook page (not a personal one that can only be viewed by your Facebook friends? Whatever your art form you need good photos, for your website and for advertising whether it be printed or online – Good photos are a must. If you can’t show a prospective gallery photos of your work how do you expect them to agree to take your work? 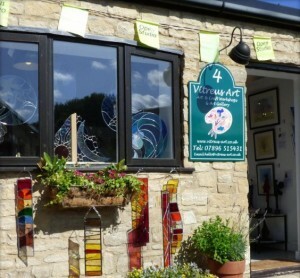 If you are taking pictures of 2D art, take the photos before the glass goes on – reflections in the glass are a no-no! Do you have business cards and or a flyer with information about yourself and your work? Have you decided what you will be offering the gallery? Continuous supply of work – if this is your option then can you keep up with demand, can you supply the work as and when it’s called for? Is your work properly prepared for a gallery? Does it have hanging fixings applied – And yes, I have had work with the fixings in a bag, expecting me to fix them onto the back of the frame before hanging; that’s not the gallery’s job! If the work is in a frame – is the back sealed properly? Is the work labelled in the way the gallery would like? Please don’t deliver work to one gallery straight from another with their labels on, and don’t leave the previous exhibition’s pricing on a piece of work. And here’s a critical point – will the gallery be able to make enough money on the commission to justify devoting wall space to your work? If your work sells for £30 and the gallery’s commission is 50%, the potential revenue to the gallery is only £15; instead the gallery is likely to prefer to display a work with a selling price of (for example) £200 – the gallery makes a nice round £100 instead when they sell it! As an aside – some galleries run themed exhibitions – if your work suits the theme of a show coming up you may find submitting work for a themed show is a good ice-breaker as those galleries will be expecting submissions from artists they haven’t worked with before. Now – please don’t tell me you’re now off to see a gallery before you’ve done some research? Consider the points above – come up with a list of galleries you think will be a good fit. Pay them a visit but don’t approach them on this occasion. This is your chance for you to see if you think your work will fit in their space. At this stage we suggest you consider the distance – if your work sells well will you be prepared to travel to the gallery to re-stock? We’ve been guilty of this ourselves – working with a gallery more than 100 miles away, so the sales generated didn’t even cover the petrol, let alone the time involved or the cost of creating the art-work in the first place! Now you have your list of possible (your work suits their style, price points and ethos) you can initiate contact! Send them an email, addressing the owner/manager in person, introducing yourself and the reason you are contacting them – this is where having a decent website, a business Facebook page and good-quality photos all matter. If you don’t hear back within a few days, follow up with a phone call – but be polite. Most gallery owners are busy and get a lot of prospective introductions. If they are interested you should ask for an appointment. If they aren’t, thank them for their time and ask if you may contact them at a later date, most will probably say that’s ok, but if not don’t waste any more of their time, or yours, and leave it at that. Just remember – the art world is a small place so be courteous to people you may encounter again in the future! If your contact is interested in your work, great – make an appointment and get your pitch in order. At this stage make sure you find out how the gallery operates. Most galleries will display your work on a sale or return basis; if this is the case you need an idea of how long they would like to exhibit your work. Make sure you turn up to your appointment on time and present your work and yourself well. Your art is your ‘passion’ and how you present it should be confident, but not pushy. I get frustrated by artists who tell me they love what they do but then turn up with their work in a supermarket carrier bag. Much better to carefully wrap the work, or make protective sleeves to keep the frames in good condition. And think about how your 2d work is framed – marks or damage to frames is a no-no. Who would buy a piece of art with a damaged frame? Your work should look as if it’s brand new – even down to making sure there are no fingerprints on the glass. And if you want to be taken seriously, make sure your own presentation is smart too – no painter’s smock please! If the gallery owner likes what you show them, you may be asked to leave some of your work with them. Make sure it’s in saleable condition, and make sure you receive a consignment note detailing the work and its price – a piece’s wall price is the price the customer pays, the artist price is what you’ll receive when it sells. Most galleries pay their artists in arrears by direct transfer – have your bank details to hand! This is a new professional relationship so it’s important that all aspects are professionally handled. If the gallery doesn’t take your work, ask for a reason why (without being offended) as feedback is often useful; aim to keep the door open for future approaches with new work or a different style, or a different price point. Happy hunting and good luck getting your work on show!